What ARE you, anyway? She or he? 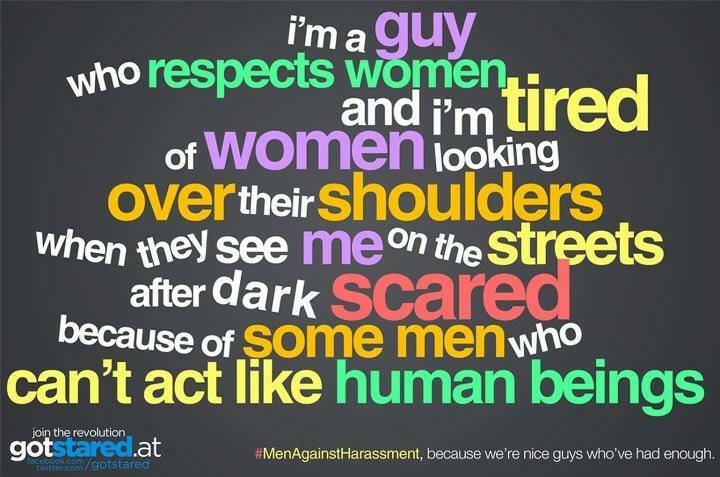 I saw this on Facebook yesterday and it made me think of all those times when a woman around me clearly thought I was a man and treated me as such by clutching her purse, looking over her shoulder, distancing herself from me, etc. On the one hand, I applaud women protecting themselves. After all, men are the number one cause of violence against and death of women; so, yes, please make sure you are mindful of the men around you who you think might do you harm. On the other hand, when this and a thousand other little things like it happen to me daily, I can’t help but feel invisible in this patriarchal world. People, in general, see the hat and the “men’s” clothing and they automatically see a man standing before them, while the woman who is actually there is completely invisible. As a Butch, I am invalidated by the straight community, shunned by parts of the lesbian community, and outright mocked by the trans community. The straight community thinks I should be more feminine, parts of the lesbian community think I just want to be a man, and the trans community thinks I am a transman in denial who should just transition already. We were born women and we were raised women in a male dominated society. We may be masculine, but we are still women. True, there are some butches who like to play the pronoun game on-line by demanding that everyone use male pronouns when talking to them. These are women who feel like they cannot be masculine unless they are as close to being male as a woman can possibly get, which includes using male pronouns. These are butches who live completely in the binary that the patriarchy has forced down all of our throats and with which the patriarchy has blinded so many of us into thinking that only men can be masculine and only women can be feminine. This way of thinking and being is troublesome for butches as it perpetuates the invalidation of the women that we truly are. It continues to make us invisible in this world and creates a false sense of security for those butches who take on male pronouns; as if they are somehow now immune to what the world at large truly thinks of us because they make people call them “he” on-line. This has also caused a shift in the butch-femme community where most femmes on-line use male pronouns with butches as the default. The very people who know us best, the women who have always seen us and have always been there for us now see only the maleness and no longer see the women that we are. It’s as if, suddenly the yin is invisible to the yang, making neither whole. In the real world, of course, this does not happen. Butches are all women and we embrace the women that we are, accepting and relishing in the use of female pronouns; but on-line, we are bombarded with male pronouns and treated as if we are strange for not accepting and embracing them as our own. Butches don’t want to be men. Butches don’t want to be compared to men in any way, shape, or form. We are women who love women. This entry was posted in Uncategorized and tagged Butch-Femme, Facebook, Invisibility, Lesbian, Patriarchy, Pronoun, Woman.